My name is Hanne Mi S. Sauge and I was born in Oslo 1961, Norway, where I completed studies in arts and crafts combined with a touch of teaching experience. My ceramic products are guaranteed made by hand with love, effort and passion and will color your everyday life with many happy moments. Test when visiting a mug, ask for coffee or tea and enjoy the good feeling. I am a full-time studio potter from 1990 and I am situated on the main road in the southern part of Zakynthos Island, in the Vassilikos region. In a comfortable stone house, I have a studio and showroom where I work and sell my creations directly. From May to October, my studio and showroom are open to the public. In the winterperiode please call before your visit. I produce tableware for everyday use, ceramic sculptures, tiles for the bathroom and kitchen, sinks, fountains and much more! My favorits to create are murals of all kind. All stoneware is fired at high temperatures of around 1270 degrees Celsius. Cadmium or Lead are not used in any of the glazes, and all of my products are food safe. Tested by EBETAM. I believe that the forms and colours of my work are inspired by the simplicity of my northern homeland (Norway) and spiced up with more southerly rich Mediterranean temperament vivid colors from the sea and shore. 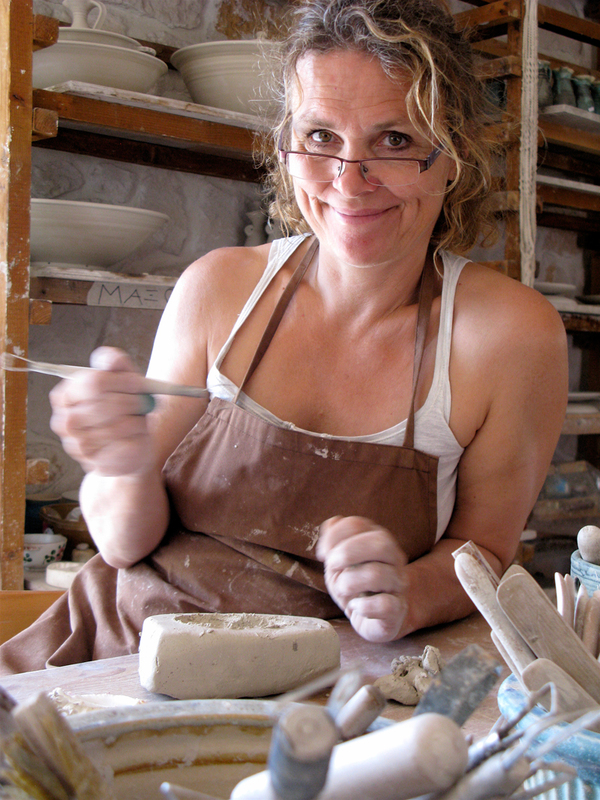 I have collaborated with several potters and artists throughout her career, including John Dunn (UK) Artist, Simon Shaw (UK) Artist , Russell Gibbs (UK), Artist Peter Knuckey Artist, Michael Sheele (USA) and Susanna Bäckström (Sweden) Artist , with these experiences contributing to the development of my unique style. In 1988-1989, I took sculpturing lessons at the privately operated Oslo Sketching and Painting School (Norway). I developed my sketching under instruction by the artist Wolf Wolfsmoon (Artist) same year. Oslo, Norway. When I find the time I participate in exhibitions in Greece and abroad. Since 1995, I has taught ceramics every summer to visitors of the Austrian Summer Acadamy SOAK. I also teach individual and group lessons at my studio throughout the year. Several assistens and students from all over the world have been passing through my studio. Some had, some had non experience before with Art and Crafts. Within a short period of time they have started creating ceramic work and even opened there own studio. Two studios are to find in Zakynthos but also in my homeland Norway. Give me a new idea and I will try to realize it for you. I gladly take commissions. Don’t forget to ask for a free cup of Coffe or tea and test one of our mugs!